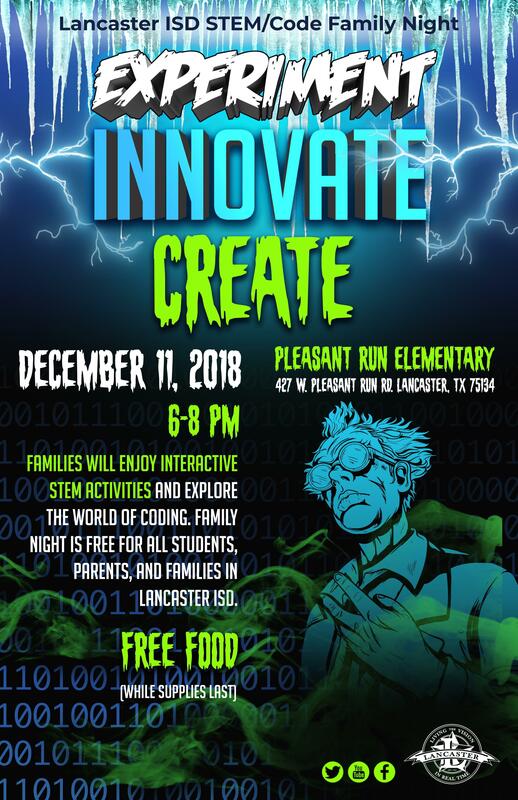 District families and the community are invited to attend and experience Lancaster ISD STEM & Code Family night as its teams up with the Perot Museum to offer an expansive STEM, technology evening of interactive activities for the entire family at the Pleasant Run Elementary campus located at 427 W. Pleasant Run Road on Tuesday, December 11 from 6 p.m. to 8 p.m. In observance of National Computer Science Awareness Week, Lancaster ISD invites district families and the community to attend and experience its District-wide STEM & Code Family night as its teams up with the Perot Museum to offer an expansive STEM, technology evening of interactive activities for the entire family at the Pleasant Run Elementary campus located at 427 W. Pleasant Run Road on Tuesday, December 11 from 6 p.m. to 8 p.m. Designed to be an innovative, evening of exploration throughout the entire campus, event coordinators said that the hallways and classrooms will be packed with a myriad of fun activities that the entire family can enjoy. “Families can explore technologies such as 3D printers, robotics and laser cutters from the Perot Museum TECH Truck powered by DELL, experiment as an engineer by designing and building the tallest tower, creating codes for innovative computer programming. The students will be actively engaged in learning that will impact them for a lifetime.” Lancaster ISD Secondary Science Curriculum Specialist Nicole Bates said. Bates also mentioned that families can expect to participate in mini-science labs and activity stations focused on science and STEM concepts, create in makerspace stations and even enjoy the STEM Escape Room adventures. As the first K-12 STEM District in the State of Texas, Lancaster ISD is dedicated to raising awareness about computer science, technology and exposing students to new experiences while connecting them to the careers of the future. In addition, to the classroom activities, the Perot Museum will be onsite during the STEM and Code Night to offer even more activities. Since this event is being the time of the year that focuses on Computer Science, strong emphasis that this event will bring on coding and technology is exciting to Lancaster ISD Director of Blended Technology, Kimberly Clark. A step in which Millner-Williams sees as a way to build a better and strong future for our community. “I hope that this event is one of many that we will host that will raise our community’s awareness of our continued desire to promote STEM learning within the district and our desire to partner with parents and the larger community to offer a village of support to our students,” Millner-Williams said. During the event, the students, parents and community will be able to gain resources to continue the learning and experiences of the event, from making crystal ornaments, coding robots to creating home makerspaces. In addition, to the family evening of STEM and coding on December 11, Lancaster ISD will host an Hour of Code kickoff event on Monday, December 10th at 9 AM and as well as have planned computer science-focused activities throughout the week on all campuses.